Ruins of a biblical city on the east of Mount Carmel. Identified with Khelkat, the southern city in the region of Asher. 1 Kings 18 46: "and Elijah brought them down to the brook Kishon, and slew them there". On and around Tel Kassis are ruins of a Biblical city on the main ancient road (Via-Maris), on the eastern side of Mt. Carmel. 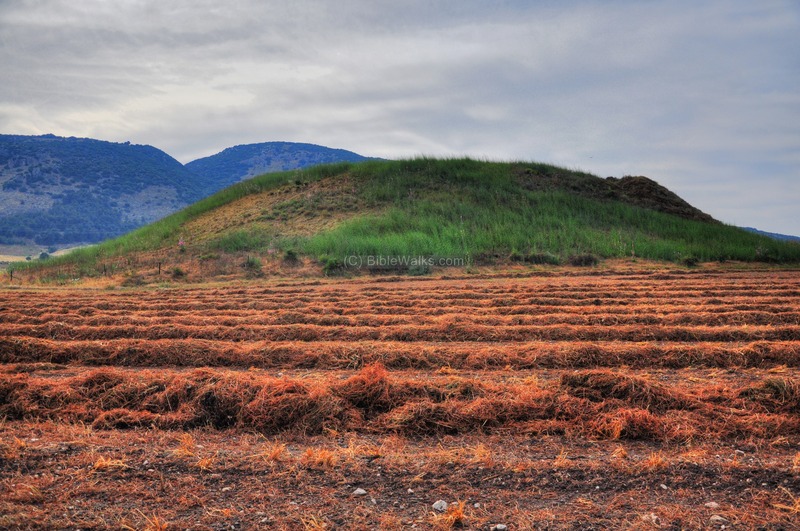 This place is identified as the Biblical Khelkat (Helkath), which was part of Asher Tribe's region, and was on the south-east corner of the tribe's area. 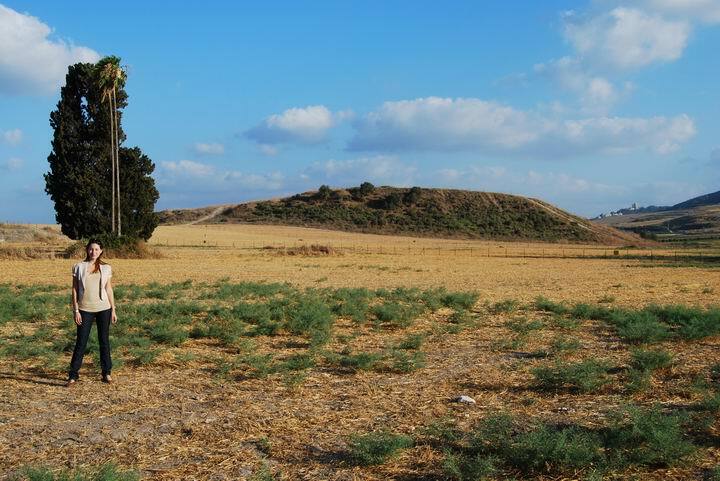 This Tel has 2 levels -the ruins of the upper and lower city on the mound. Around the mound is a large area of covered ruins, which were houses and installations that surrounded the city. The Tel is on the north of the road from Tel Yokneam to Tel Maamar. 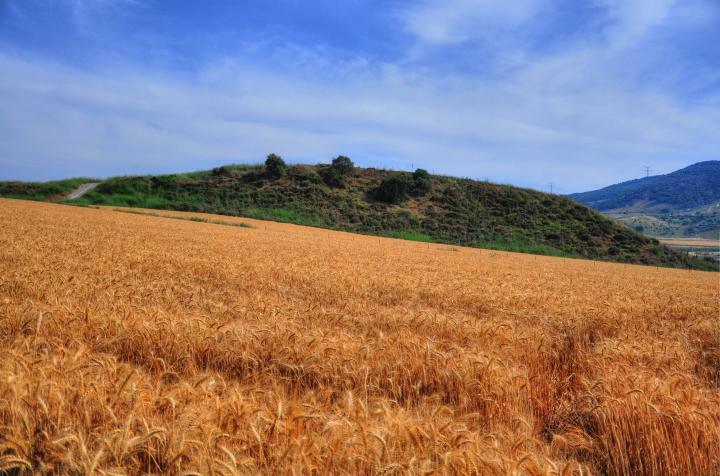 You can visit the site by driving from the road between Kefar Yehoshua and Kiryat Kharoshet. In the north of the site is a series of wells that gave the Tel its waters. On the south walls of the Tel there is another source of water: the Kishon creek. 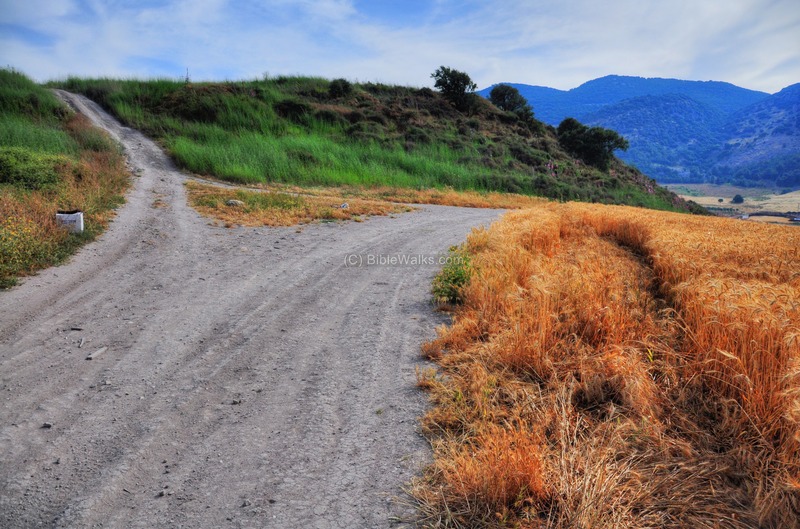 Water is another important factor for selecting a site in the biblical times. 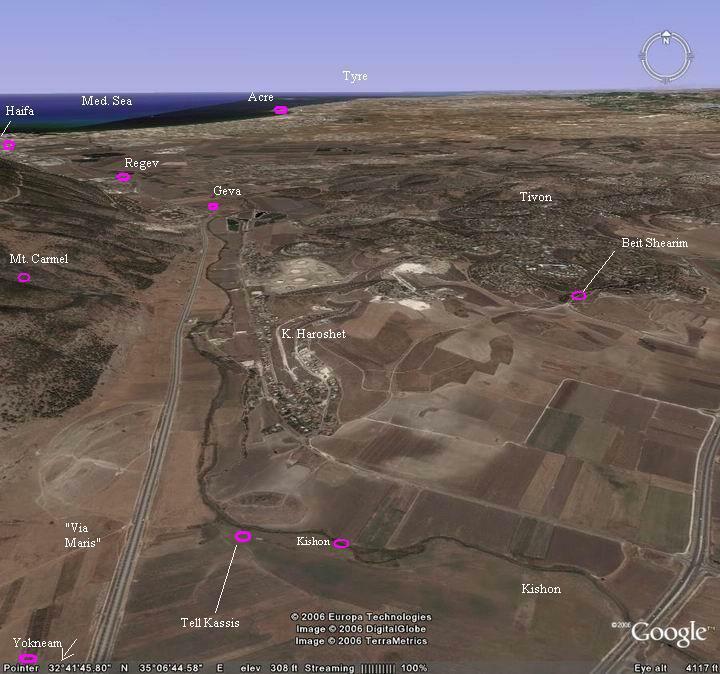 An aerial photo of Tel Kassis is shown below, indicating the major points of interest. Pointing and clicking on selected points in purple will automatically scroll to the relevant photo or site. According to the Archaeological survey, there were pottery findings from the Chalcolithic period (4,500-3150BC). The city continued to be populated in the Early Bronze (3150-2200 BC), and especially in the middle Bronze (Caananite) period (2200-1550BC). 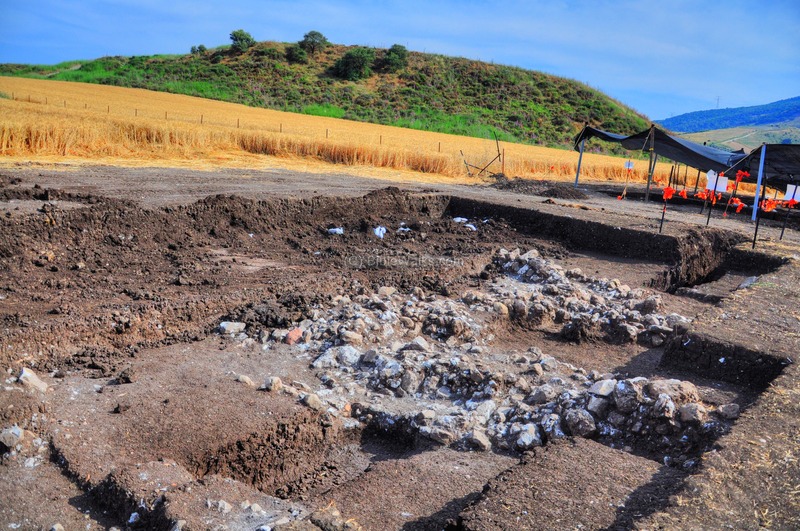 Recent digs (1977-1981) revealed 2 layers from the Middle Bronze Age (2200-1550BC), as well as 3 layers from the late Bronze age. This expedition also uncovered a wall and tower, and an adjacent room. On the floor of this room, which was severely burnt, a layer of ceramics were dated to the 18th-19thC BC. In the late Bronze period (1550BC- 1200BC) the city was an important city. It was mentioned in list of cities ('Zephat'?) that were conquered in 1468BC by Egyptian Pharaoh Thutmose III. The Bible told us that Helkath (Khelkat) was one of Menashe tribe cities (Joshua). It was also mentioned that the city and the area around it was a Levite city. The identification with Helkath is not solid, and is inferred from the ancient sources. It was suggested by Y. Aharoni and others. There are other suggestions for this site. 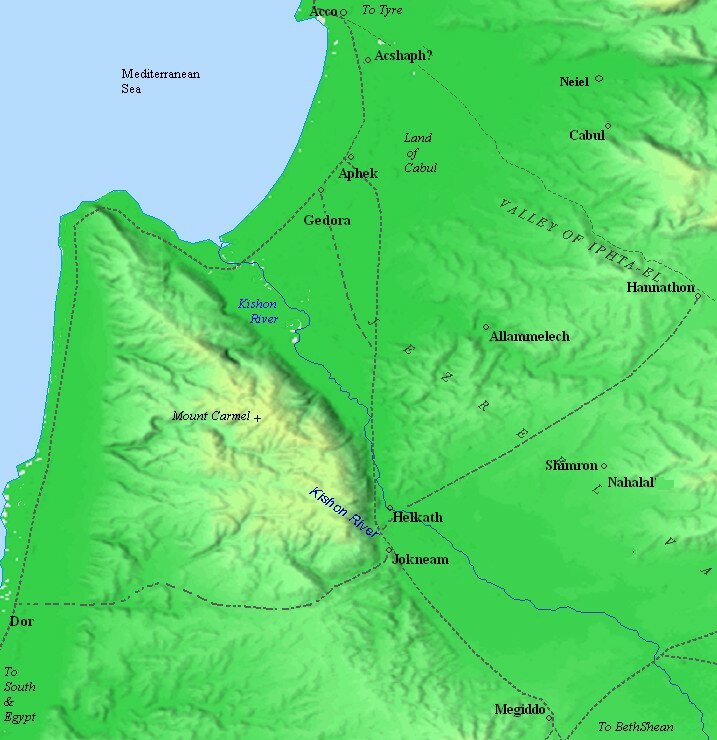 A Biblical map is shown in the map below, with the city Helkath in the center of the most important trade routes in the northern Israel (Via Maris to south, north, and east; southeast to Megiddo/BethShean) . 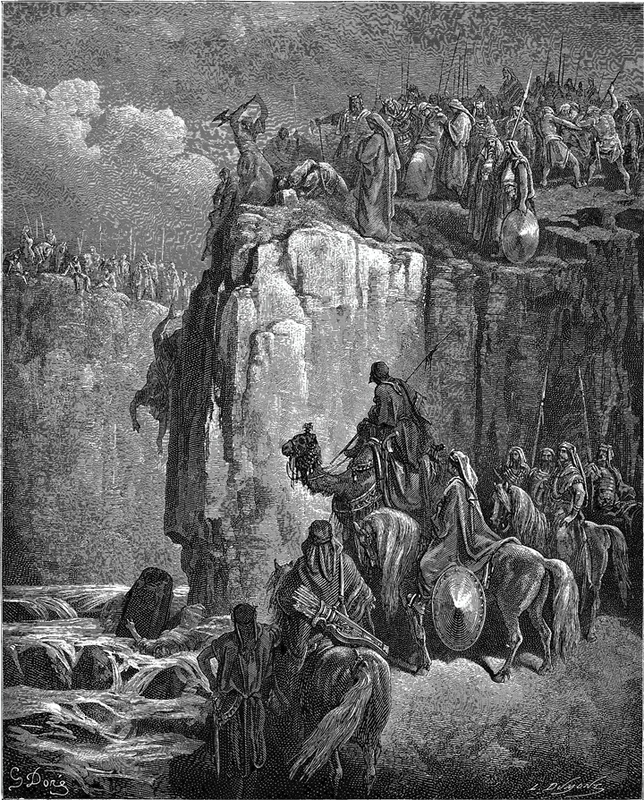 Elijah slaughters the Baal prophets - According to the Biblical description, this may have been the area where Elijah slaughtered the 450 Baal prophets. 1 Kings 18: and Elijah brought them down to the brook Kishon, and slew them there"
Battle of Deborah - The site witnessed the victory of Barak Ben-Abinoam over the Canaanites during the battle of Deborah and Barak. Judges 4 "But Barak pursued after the chariots, and after the host, unto Harosheth of the Gentiles: and all the host of Sisera fell upon the edge of the sword; and there was not a man left". Later, the city continued to be populated throughout the Persian and Hellenistic periods, as told by the ceramics. 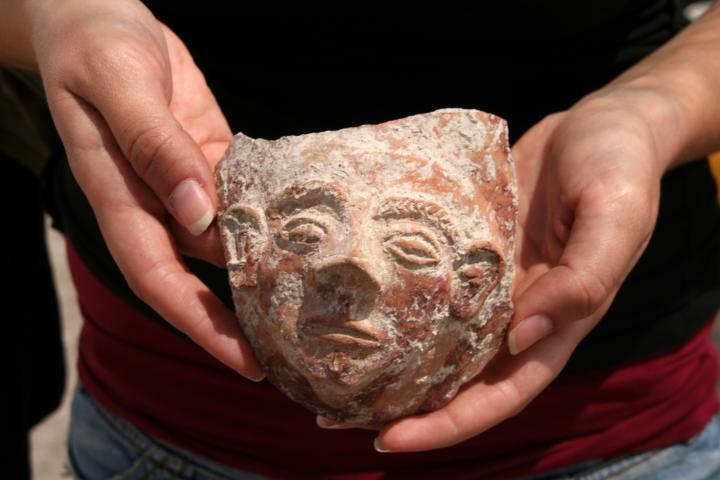 The surveyors also found ceramics from the later periods: Roman/Byzantine, Arab and Crusaders, Mamluks and Ottomans. 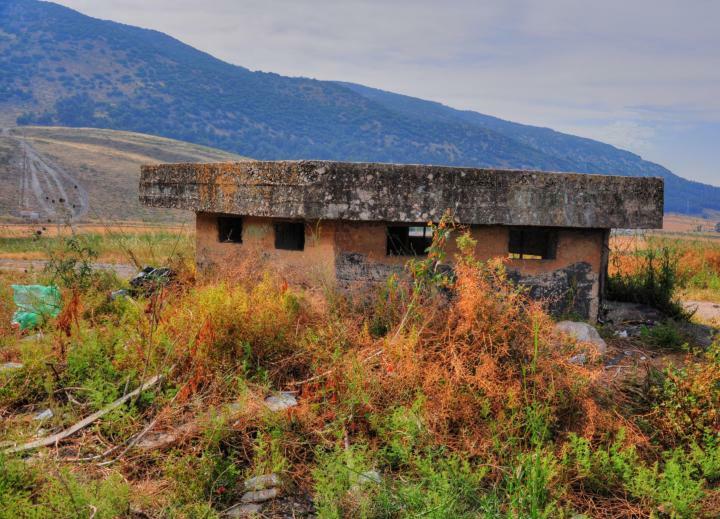 However, due to its limited size, during the later periods the site gradually became a minor site and finally abandoned. Today the site is in ruins, and is frequently used by dirt bikers who are challenged by the steep slopes, which were once the mighty protecting walls of the city. In 2010 a gas pipe was laid out along the western and eastern side of the Tel. The archaeologists opened trench squares around the pipe line, revealing new information on the ancient city. An aerial view from the north side, as captured in June 2015 by a drone, is seen here. 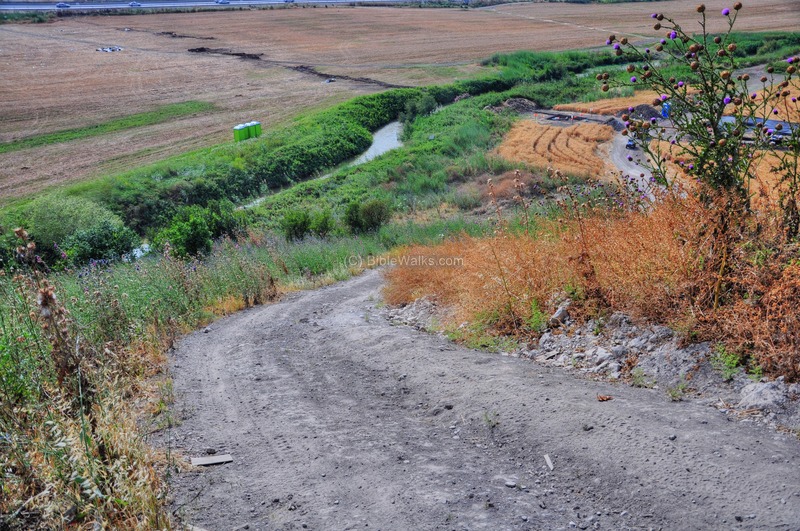 The Kishon river loops around the site from the east and south sides. The Tel has 2 levels - the west side (the upper city) is higher by 5M than the east side (the lower city), as seen in the profile of the Tel. The upper city is higher by 30M than the valley of the Kishon creek. A wall and steep glacis was built around the upper city. The road that leads to the lower city from the north-east (seen on the right side of the hill) was probably the gate of the city. Today this road, and other paths, are used by dirt bikers to climb up the steep south side. An aerial view from the south is seen in the next photo. The Kishon creek flows before the Tel, where the green bushes are near located in front of the the mound. Above the creek are the steep walls, part of the glacis that was constructed in order to make it difficult for the attackers to climb up and into the city. In the far background are the houses of Tivon. A new railroad bridge is now constructed on the north side of the site. A ground view from the west is seen in the next picture. The Kishon creek flows on the right side, around the south and west side of the Tel. In the far right background is the edge of Mount Carmel. On top of the hill is a bunker from the period of the independence war. From the southern side of Tel Kassis is a view of the Kishon creek. In ancient times it was a wider river, but in modern times the heavy pumping of the water along its course made it dwarf considerably. In ancient times the river gave the city a great defense line that no army can cross. A large natural gas pipeline project was commissioned in 2010. The project's main purpose is environmental - replacing the petrol-based generators in the Haifa bay area in order to reduce the air pollution. 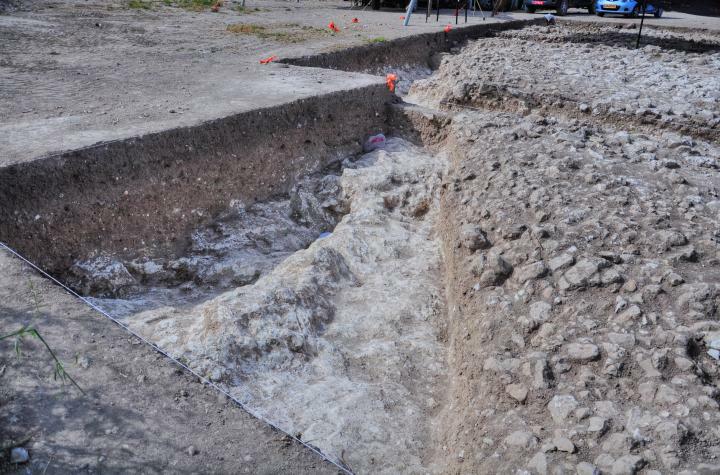 The pipeline was dug into the ground near the site, and required extensive archaeological excavations in the area during the months of March-June 2010. The first phase was laid out on the north and east side of Tel Kassis. 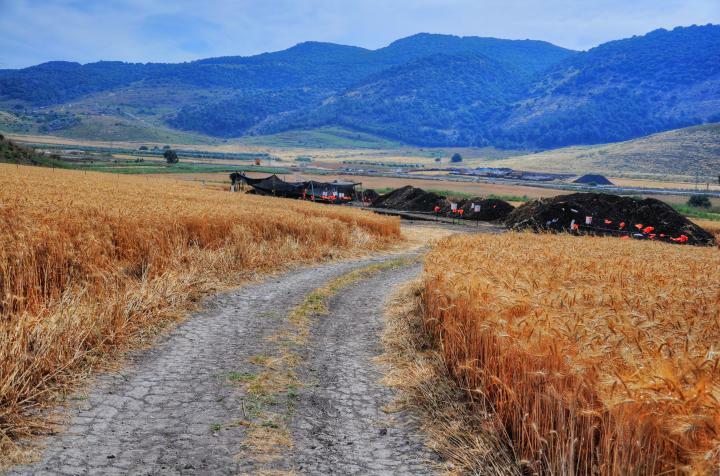 According to the IAA report: "The excavation was conducted at a prehistoric site along the route of the natural gas pipeline. 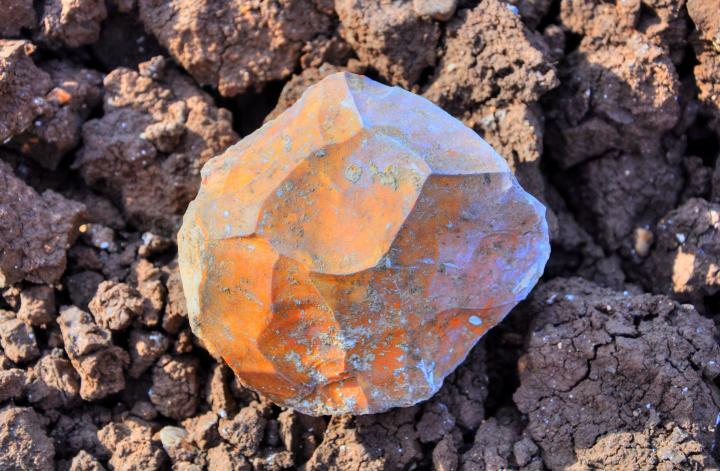 Levels yielding flint implements from the Middle Paleolithic period were exposed". 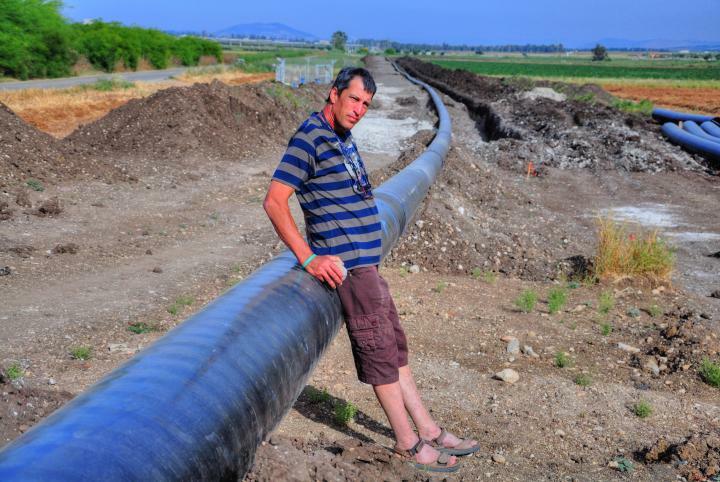 The photo shows Uncle Amnon sitting on the pipeline's eastward section, just before it was buried. This location is on the north side of Tel Kassis, near the ancient Ottoman railroad. This railroad will also be upgraded, part of the transportation projects that include a new designed highway (Road 6) that will split at this area to two northbound branches. 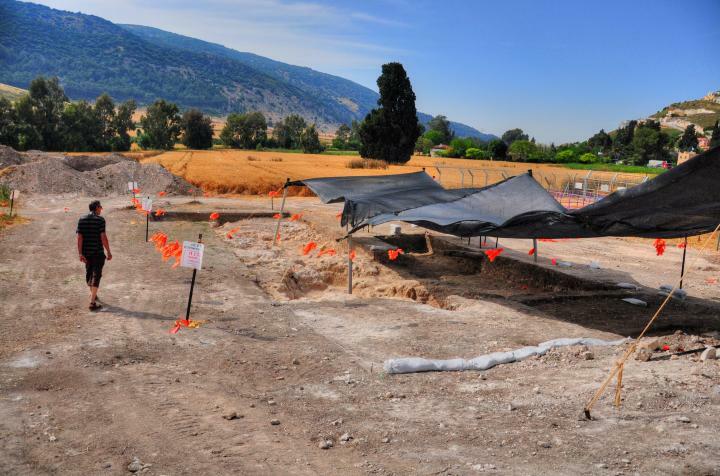 Tel Kassis will be a center of transportation, just as it was thousands of years ago. 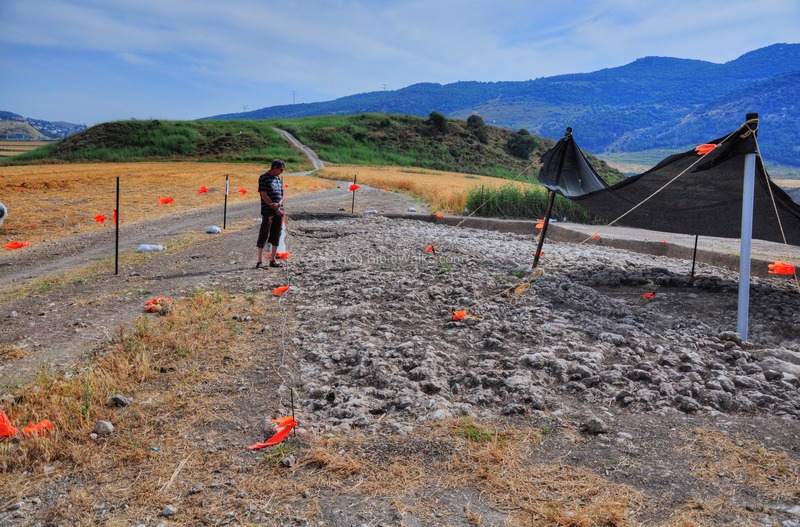 The excavation team reported their findings in another IAA report: "The excavation is located in the northeastern part of the Tel. 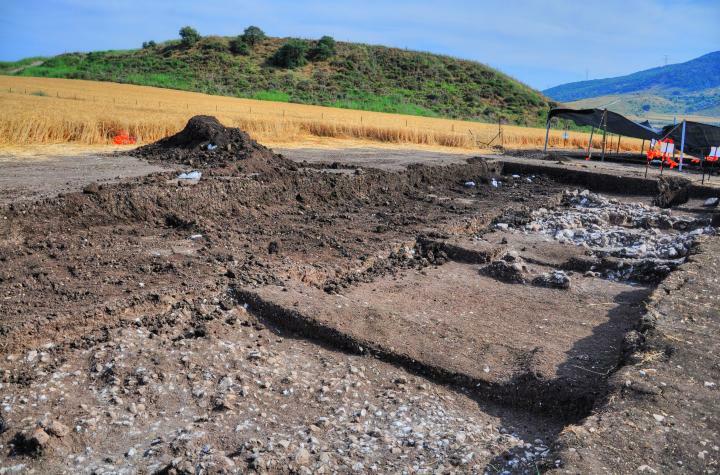 So far remains of buildings that probably date to the Early Bronze Age 1 and a cave from the Middle Bronze Age 2 whose ceiling collapsed have been exposed. 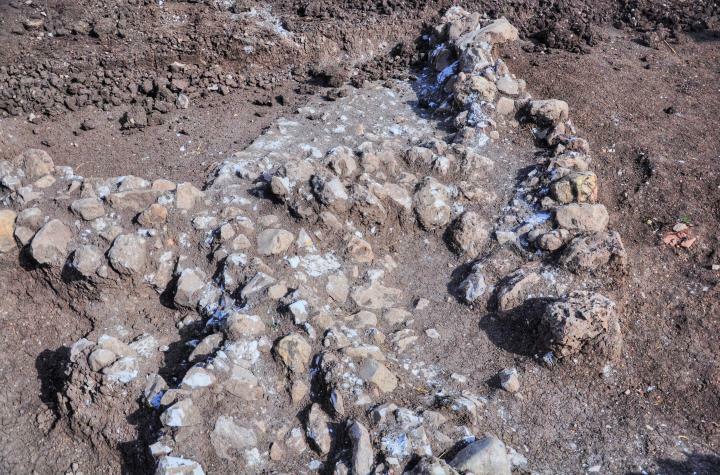 A very large quantity of Early Bronze Age 1B hole-mouths and pottery wheels (not in situ) were discovered, that seem to suggest the existence of a workshop there". 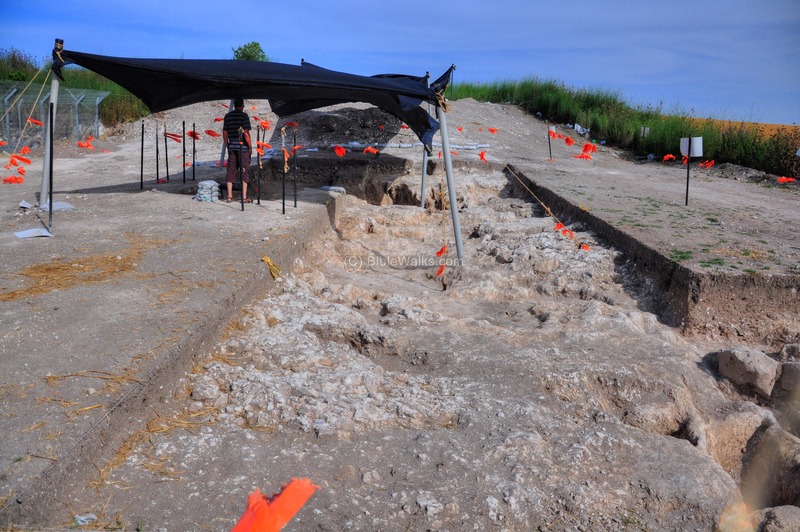 During the 2010 excavations a rare discovery was found in a rock hollow in the bedrock. The archaeologists found a hoard of more than 100 ancient cultic vessels and other artifacts, which are dated 3,500 years old (late Bronze period). 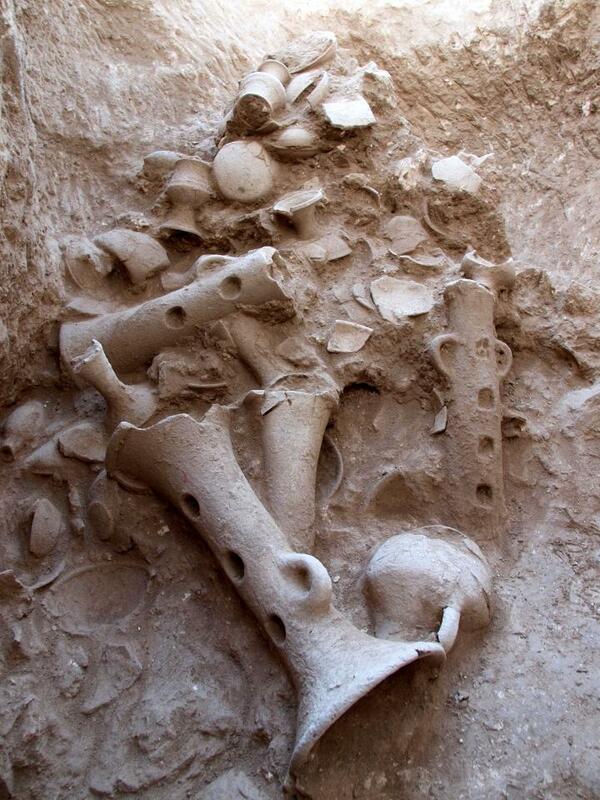 Most of the vessels were found in rare good shape, while others can be reconstructed and repaired. 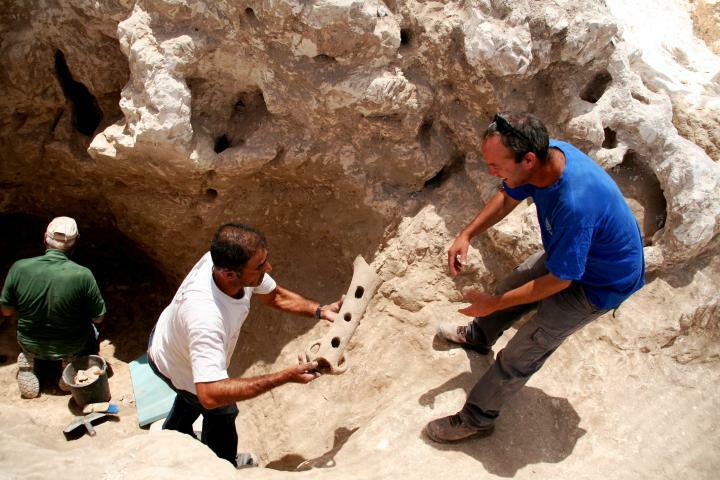 The treasure was found inside a rock-hollow, which was accessed in ancient times by two broad steps. The vessels were piled one on top of the other. They were either buried in ancient times in order to protect them, or stashed away after they have been obsoleted. The vessels are now undergoing a processes of reconstruction and preservation and will soon be displayed in a special exhibition. This is the text on Elijah the prophet and the slaughter of the Baal prophets. King Ahab contested the prophet against his false prophets, and Elijah -with the help of the true God - prevailed. He slaughtered the 450 Baal prophets in the Kishon riverside, somewhere around this site. "...And Elijah said unto them, Take the prophets of Baal; let not one of them escape. And they took them: and Elijah brought them down to the brook Kishon, and slew them there". Read more on Keren Carmel which is located on the Carmel above this site, and is associated with Elijah and this event. Barak ben-Avinoam trapped the army and Chariots of Sisera, the General of the Canaanite King Jabin, and defeated him. Barak used the flooding of the Kishon to overcome the mighty army equipped with chariots. He chased the Canaanite army through this point and finished them in the valley between Tel Kassis and Tel MeAmar. For more information on the battle of Deborah's see "Barak and Deborah". "And I will draw unto thee to the river Kishon Sisera, the captain of Jabin's army, with his chariots and his multitude; and I will deliver him into thine hand...."
"And Sisera gathered together all his chariots, even nine hundred chariots of iron, and all the people that were with him, from Harosheth of the Gentiles unto the river of Kishon". "But Barak pursued after the chariots, and after the host, unto Harosheth of the Gentiles: and all the host of Sisera fell upon the edge of the sword; and there was not a man left". "And the hand of the children of Israel prospered, and prevailed against Jabin the king of Canaan, until they had destroyed Jabin king of Canaan". The Arabic name is Tell el-Qassis - "the mount of the priest". This name is due to the tradition that here was the slaughter of the Baal prophets by Elijah (see also Keren-Carmel). In Hebrew Kashish is "old man"
"Khelka" in Hebrew means "yard" or "field", and "Khelkath" is the "yard of-". 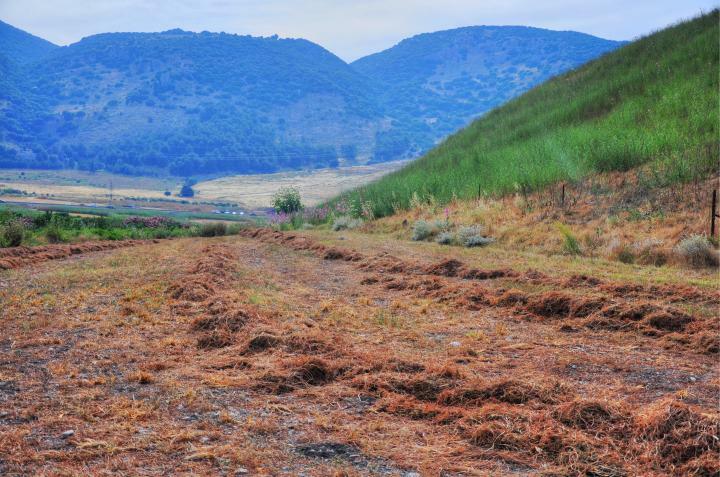 In the photo below, Webmaster Rotem standing in the field north of the Tel. This is an old photo of 2007, captured before the railroad was constructed on its north side. Recent digs - Arch. digs (1977-1981) by Prof A. Ben Hur and Dr Y. Portugali. Tel Yokneam - located 2Km to the south. According to the Bible, Yokneam was part of the Tribe of Zebulun (Zevulun). Beit Sharim - this site is 2KM to the north, and was a large ancient city, including a famous necropolis (with tombs buried inside caves).